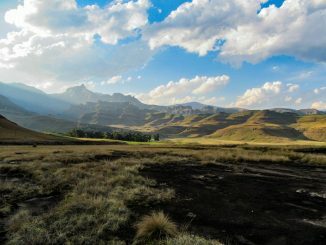 Cockade Pass is a Drakensberg pass (i.e. 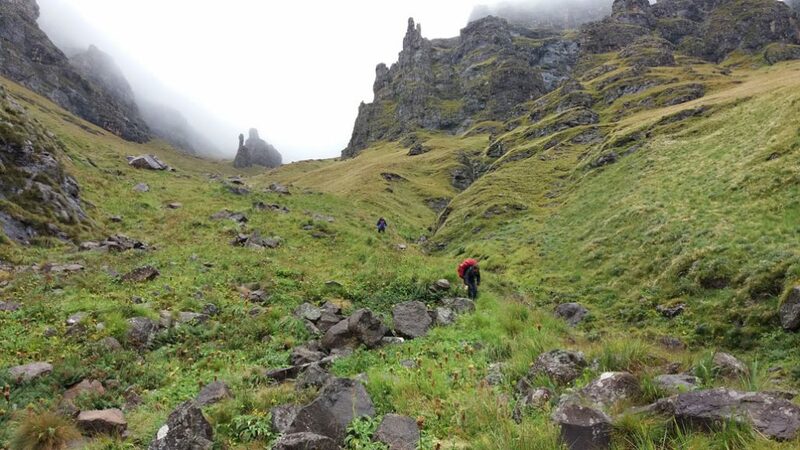 an access way to the Drakensberg escarpment) in the Cathedral Peak area. It lies approximately between Cleft Peak and Cathedral Peak. Relative to the major passes in the Cathedral Peak area, such as Mlambonja Pass to the north and Organ Pipes Pass to the south, Cockade Pass is little known and challenging. It shares an entrance with Xeni Pass, splitting to the south from the Xeni River about 1.5km upstream. I would recommend it only for people with some Drakensberg experience, who enjoy a good scramble and a bit of bush bashing and self-navigation. Our campsite at the bottom of the pass on day 1. 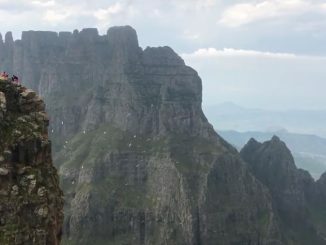 Cathedral Peak is located in the northern Drakensberg, with central Drakensberg access points and peaks like Injisuthi and Monks Cowl to the south, and the Royal Natal National Park to the north. 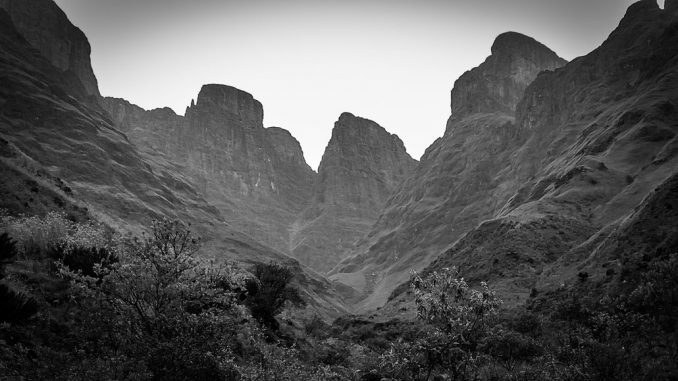 The Cathedral Peak valley is conservation land and is administered by KZN Wildlife. It forms part of the larger uKhahlamba Drakensberg Park. Cathedral Peak itself does not form part of the main escarpment. It forms a “finger” that protrudes some 5km to the east. Access to the Cathedral Peak area is typically from the KZN Wildlife office at Didima near Cathedral Peak hotel, where hikers can leave their vehicles. The campsite at Didima is derelict and cannot be used as of March 2018. We approached Cockade Pass as a three-day circular hike. Our intention was to hike from Didima to the bottom of Cockade Pass, where the contour path crosses the Xeni River, on the first day, a distance of 9.5km. 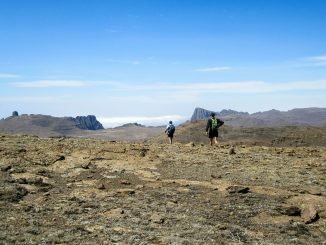 On the second day we had hoped to climb Cockade Pass, a 1,000 metre ascent over a 2.5km distance, and then to proceed north along the escarpment to the top of Mlambonja Pass, a further 5km to the north. On the third day we would have hiked back to Didima via the Bell Traverse, a well-known path on the northern slopes of Cathedral Peak, which would have been a distance of 16km. Unfortunately we were forced to camp on the escarpment near the top of Cockade Pass on the second night, and to return to Didima on the third day via a hike along the escarpment (5km) and a descent of Mlambonja Pass (13km), which is a shorter alternative to the Bell Traverse, as a result of our fairly slow speed, one of our group being injured, and the poor, wet weather. In hindsight, I am glad that we were able to use what was effectively an escape route. 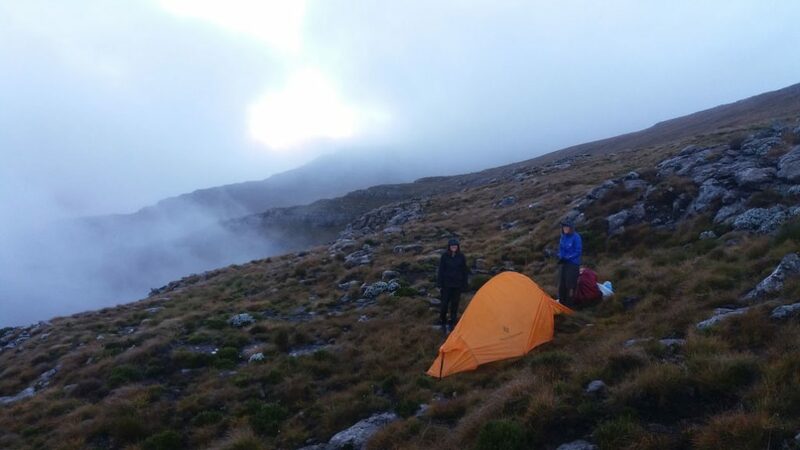 There is a campsite near the bottom of Cockade Pass, approximately 200 metres up into the Xeni River kloof, with limited camping space. Once you reach the top of Cockade Pass, you can camp anywhere on the escarpment. However, the area at the top of Cockade Pass does not have water, and one would have to hike to either the Maroleng Stream (1km to the southwest in an open valley) or to the Kwakwatsi Stream in an area immediately to the north of Xeni Pass (2-3km to the north) for a reliable supply of water. Alternatively, spend the second night in Twins Cave, near the top of Mlambonja Pass, which offers a wonderful view of the main Drakensberg escarpment to the north. Our campsite on the escarpment. At lower altitudes (below 2000m ASL), you will walk in the Little Berg, with its eroded sandstone cliffs, rolling grassland, indigenous forests and clear mountain streams. You will either see or hear baboons, and you may also see buck species like duiker, oribi, grey rebuck, and eland. Raptors are not uncommon, and you may well spot Jackall Buzzards, Black Eagles, Cape Vultures and Bearded Vultures. Lower Berg on day 3. On the escarpment (3000 metres ASL), you will find a desolate and open landscape, with large valleys and undulating hills. Plant life is limited to hardy grasses and schrubs, and apart from baboons and raptors, you are not likely to see many animals. Views of the Lesotho plateau, the sheer cliff faces of the Drakensberg, and of the valleys down below in South Africa, are beautifully dramatic. Cockade Pass is a difficult hike, particularly in wet, misty conditions. It is steep and fairly technical in places. Often the hiker must scramble or climb up steep rock or tip-toe around narrow ledges. You will use both your arms and legs. Stream crossings are also common. We could not find a clear path for most of the pass, although some claim that such a path exists. Bush bashing was therefore the order of the day. Near its bottom, Cockade Pass has thick vegetation, and we found the going tough and progress slow. 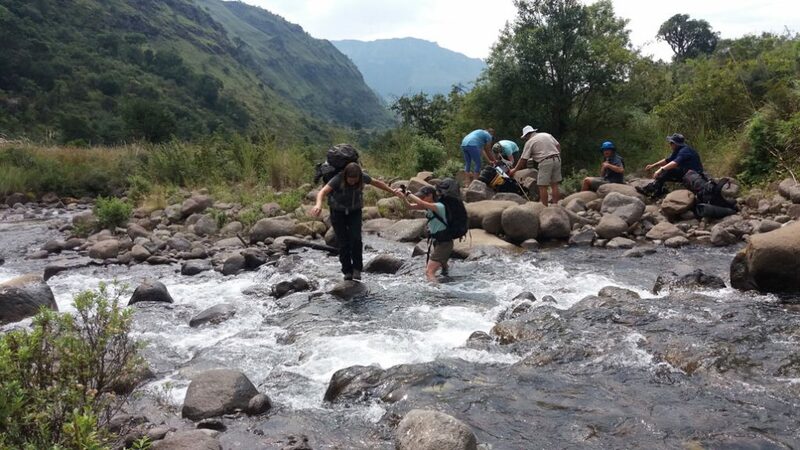 River crossings on day 1. Navigation in the pass is also not always self-evident. Initially one follows the Xeni River, and the turnoff into Cockade Pass proper is fairly evident. Thereafter, there are a number of steep dead-end gullies, which are not easily avoided unless one has a GPS. As for the rest of the hike, Little Berg hiking is equivalent to standard hiking in South Africa, with perhaps one difference, that routes are not clearly marked, although the path should be fairly obvious. Our escarpment hike was short, around 5km, and we found the going to be easy. Although there was no path as such, cairns indicated the general direction fairly well. 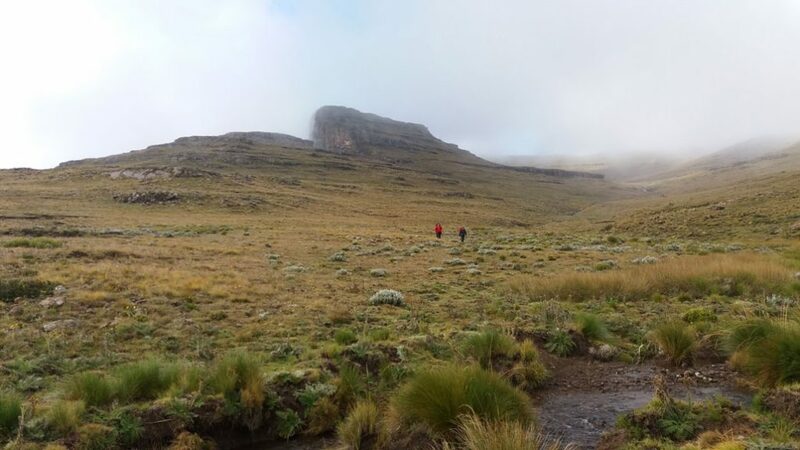 Mlambonja Pass, although steep, has a clear path and does not require scrambling, and I would recommend it as the easiest route to the escarpment for persons unfamiliar with the Catheral Peak area. At the bottom of Mlambonja Pass, however, the vegetation is dense. We lost the path and had to do some bush bashing. The top of Mlambonja Pass is marked by a large cairn. Finding the top of Cockade Pass, had one completed our circular route in reverse, might have been a challenge, because there are a number of similar-looking gaps in the escarpment in the area around the top of Cockade Pass. Cockade is a tough pass. I would recommend it only for people who know the Cathedral Peak area, suffer from curiosity, and seek a challenge. 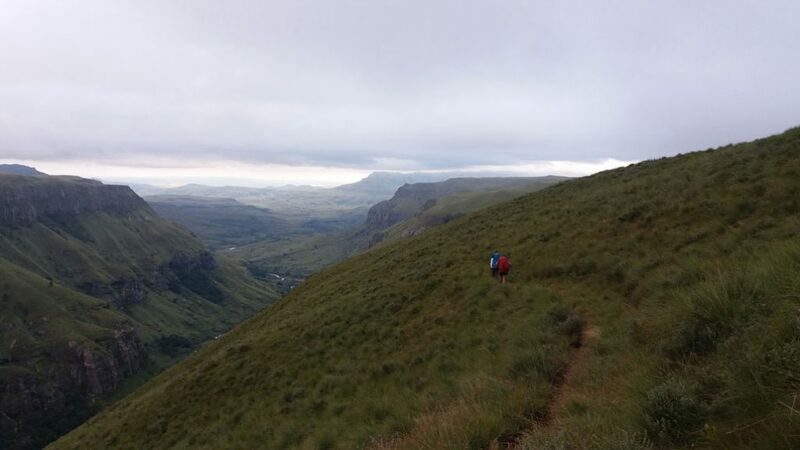 It is advisable to be fit, strong, and to have some navigation experience in the Drakensberg. There are more comfortable alternatives in the Cathedral Peak area which will allow much the same scenery. 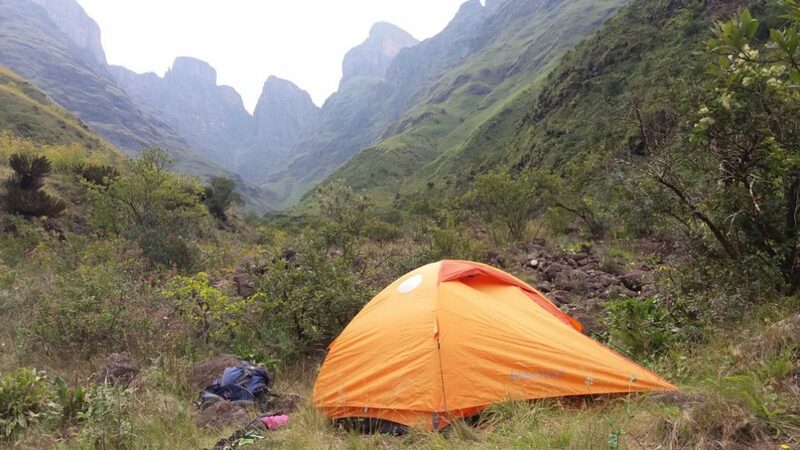 A permit fee of R70 per person, per night, is payable to hike in the Kwa-Zulu Natal Drakensberg and that could be done at the KZN Wildlife Office at Didima (i.e. the start of the hike). No bookings are required unless you wish to sleep in a cave, which you can book free of charge. A detailed 1:50000 topographical map of the Cathedral Peak area, called map No. 2, is essential and can also be purchased at Didima. Drakensberg Hiker took a group of ladies on the Northern Traverse in the Drakensberg. One of the most underrated passes in the Drakensberg imho. Views of the Elephant and Cockade as you ascend the pass are mind-blowing. Combined with the Bell Traverse gives you one of the finest 3/4-day hikes anywhere. I rate this pass as the most beautiful route in the Drakensberg. Definitely well worth the effort! I have done it 3 times, once looped with the Bell Traverse as a day hike. That was definitely the best day hike I have ever done.